In the absence of any political change or agreement, Syria is unlikely to witness large-scale funding given the abstention of most donor countries from allocating the amounts needed to launch the reconstruction. Therefore, it would be preferable to adopt a smaller-scale, yet more realistic and efficient policy by encouraging the creation of specialized funds for specific sectors and activities, focusing mainly on agriculture, manufacturing and construction at the expense of tourism. As Syria’s eight-year war wraps up, debates started on how the reconstruction of the destroyed cities, villages and infrastructure should begin. However, before discussing the different possibilities of starting the rebuilding, it is worth mentioning the huge cost of this process and its direct impact on the Syrian government and international community. The UN’s economic and social commission for Western Asia estimates the cost of Syria’s reconstruction at $388 billion for 15 years, and the cost of lost productivity to GDP at around $268 billion. Usually the international community steps in to rebuild after a civil war as a way to solidify peace and prevent the relapse of conflict and to create conditions under which refugees and displaced people could return home. Russia already raised the issue of returning the Syrian displaced people and refugees and of rebuilding Syria to the UN Security Council. We are thankful for the Russian initiative to return Syrians to their country, and here I highlight that the Lebanese President welcomed and supported the initiative in his speech before the United Nations in September 2018 stressing its importance. Also, the Lebanese Minister of Foreign Affairs talked about the return of Syrians to their country and homes on several occasions and conferences related to the Syrian crisis. However, the Russian initiative is faced with American reluctance, or even refusal before reaching a political solution to the Syrian crisis, namely new constitution, new government and future role of President Assad. Noting that the USA considers participating in this process before reaching a final political settlement would send a signal to President Assad to re-impose his authority in the same manner as before. This will hinder the reconstruction and have direct negative impact on the return of displaced Syrians, whether inside the country or those sheltered in Lebanon, Jordan and Turkey. Since the Syrian conflict began in March 2011, more than 6.5 million were forced to move inside the country and 5.6 million in neighbor countries. Lebanon, based on its human and brotherhood commitment, hosted the biggest number of them second to Turkey. However, the country’s limited capacity to absorb those numbers, its vulnerable economy, undeveloped infrastructure, small area and weak resources, with the security repercussions and the economic, social, environmental and political outcomes, all shook its stability and led to the exhaustion of the Lebanese society, the state and its institutions. The number of displaced Syrians in Lebanon registered with UNHCR is almost 1 million and another half million is unaccounted for – I mean not registered with UNHCR – reaching up to 37% of the total Lebanese population. The population density increased from 400 to 520 people per square kilometer, and for every Lebanese there is one displaced person. Whereas in the European Union countries, which are economically advanced and have larger areas, refugees account for only 2% of the population. In addition, 384,000 Syrian displaced entered the work market, into sectors exclusively specific for the Lebanese, such as free professions, or into conditional sectors like vocational industries and handicrafts (we are not speaking here about the traditional Syrian workforce). This resulted in 270,000 Lebanese out of work, raising the unemployment rate from 11% in 2011 to 35% in 2017. The growth rate shrunk from 8% to 1%. Poverty increased by 56% among the Lebanese. The purchasing power diminished and immigration, mainly among the youth, increased. The situation of Syrians is not any better; 91% suffer from food insecurity. 53% live in shelters lacking the minimum human dignity. 18% live in random camps. Poverty rates have reached 76%. In addition to unregistered marriages, 83% of births are not officially registered. 74% do not have valid legal residence documents, not to mention figures about school dropouts, early marriages, sexual harassment and abuse by the extremist groups. In light of this tragic reality and since the Syrian government has regained control over the majority of its territories thus eliminating the reasons for their displacement, it is necessary to assume the national and patriotic responsibility of ensuring their safe return to Syria, in line with the principles of self-exclusion, state sovereignty and non-interference in internal affairs. In other words, their return should not be linked to a political solution; neither should there be an attempt of using them as political cards to serve any foreign agendas. Driven by the principle of shared responsibility and burden sharing, the international community must be encouraged to facilitate the return of Syrian refugees and empower them economically in Syria so they can once again live normally and with dignity. Moreover, it is important to take into consideration Lebanon’s inability to absorb this huge number because of its small area and limited resources making Lebanon a country long-associated with emigration rather than asylum and settlement. In fact, the population of Lebanon is 4 million inhabitants compared with 14 million Lebanese in diaspora. Yet, given the specificity derived from its constitutional fundamental provisions that prohibit the “fragmentation, partition, and settlement”, if Lebanon opens its borders and respects the principle of non-refoulement, driven by its humanitarian commitment, it is not bound to host them until a political solution is reached. Not by fear of integration that could result in a collective naturalization, prohibited by the constitution, nor pursuant to the solutions provided for in the 1951 Convention and 1967 Protocol relating to the status of the refugees, as Lebanon did not sign either. Nevertheless, Lebanon must ensure a safe, decent and gradual return, thus safeguarding Lebanon’s sovereignty and Syria’s identity. In brief, the principle of burden sharing imposes the distribution of displaced Syrians among the hosting countries based on their capabilities. This was not the case with the war on Syria, where Lebanon paid the highest humanitarian price. However, Lebanon should not pay the price for peace. With their presence, Lebanon bears a double risk: the first related to the Lebanese state, its stability, its existence, and the message of pluralism that it conveys in the Arab world. While the second is the risk of Syria losing its identity, the dignity of its people, the unity of its lands, and its social diversity. All that leads to social tensions resulting from overpopulation, high demand on services, jobs, facilities, in addition to the danger of population screening to impose the partition that Israel has so far not been able to do. The outcome of the Syrian war necessitates an agreement on adopting a new secular constitution with a power-sharing model between different components of the republic based on democratic parliamentary and presidential elections. Today, as the Syrian army holds more than 80% of the Syrian territory, the government may consider a different approach, taking in mind the basic fact that Syria remains a united country, within its complete geography. A political settlement or agreement should be reached between the Syrian government and opposition groups which participated in the Astana process, an agreement similar to the Lebanese one that put an end to the civil war. A draft of the new constitution was provided by the Russian side to participants in Astana, for both government representatives and different opposition groups. But what if political reconciliation takes time to be reached? Wouldn’t this have negative impact on Syrian displaced and refugees, as well as the hosting countries, and Lebanon on top of them? In the absence of any political change or agreement, it is unlikely to witness large-scale funding given the abstention of most donor countries from allocating the amounts needed to launch the reconstruction. As Syria faces today the challenge of reconstruction, the USA, Israel and their allies will undoubtedly try to hamper that journey, deepening the crisis instead of contributing to its solution. Syria should speed up the reconstruction process by laying out the proper plans to attract investments. Hence, the Syrian government issued a new investments law that is fair to the Syrian citizens and encourages them to invest in Syria. Certainly, gas will have a major role in Syria given the historic opportunity of introducing oil industries into its economy, creating important economic prospects in the fields of petrochemicals, liquefied gas, fertilizer, etc. From 2011 until 2012, the Syrian economy witnessed a strong shock in light of the economic collapse and paralysis, the immigration of capitals and human competencies, in addition to the destruction and theft of most factories and public facilities. From 2014 to date, Syria has had multiple attempts to move forward, including exports, though relatively low compared to the pre-crisis period. In the absence of any political change or agreement, it is unlikely to witness large-scale funding given the abstention of most donor countries from allocating the amounts needed to launch the reconstruction. Therefore, it would be preferable to adopt a smaller-scale, yet more realistic and efficient policy by encouraging the creation of specialized funds for specific sectors and activities, focusing mainly on agriculture, manufacturing and construction at the expense of tourism. To do so, I suggest that conflict parties should agree to divide Syria into areas of responsibilities as rebuilding countries compete to make each area more livable for civilians. 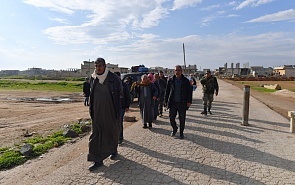 In order to ensure the return of the Syrian displaced, the international community must continue providing them with assistance for a certain period after they return to their country and homes, with a special attention to the small towns and villages.